Our new organic infused extra virgin olive oils are made in Southern Italy with just two simple ingredients. They have been created following a traditional, entirely natural process - by pressing organic Calabrian rosemary together with organic, single estate Ottobratica olives resulting in a unique oil which is beautifully balanced, tasty and healthy. It is very low in acidity (just 0.2%) and high in polyphenols (the anti-oxidants that are said to help prevent cancer, arteriosclerosis and slow down the ageing process). 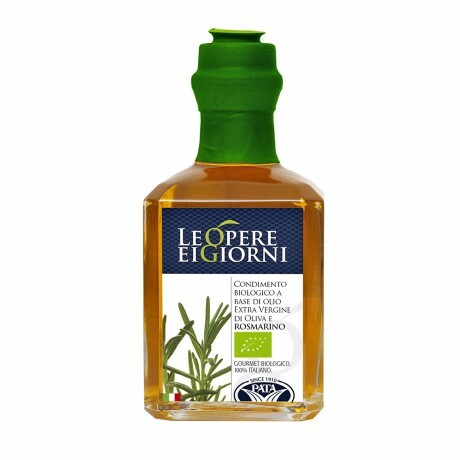 This organic oil has a distinctive flavour and aroma, reminiscent of warm Mediterranean evenings! It's the perfect accompaniment to roast potatoes and a variety of vegetables as well as meat dishes. Add a little to your salad dressings or marinate.